Brett Lewis (left) controls the ball for Miami Trace against Washington’s Seth Hanusik during an SCOL match Tuesday, Sept. 13, 2016 at Miami Trace High School. Also pictured: Kody Burns (17) for Miami Trace and Kenny Upthegrove (2) for Washington. On a hot, mid-September evening, the Miami Trace Panthers varsity soccer team welcomed the team from Washington High School for the first meeting of the season between the two SCOL and Fayette County rivals. 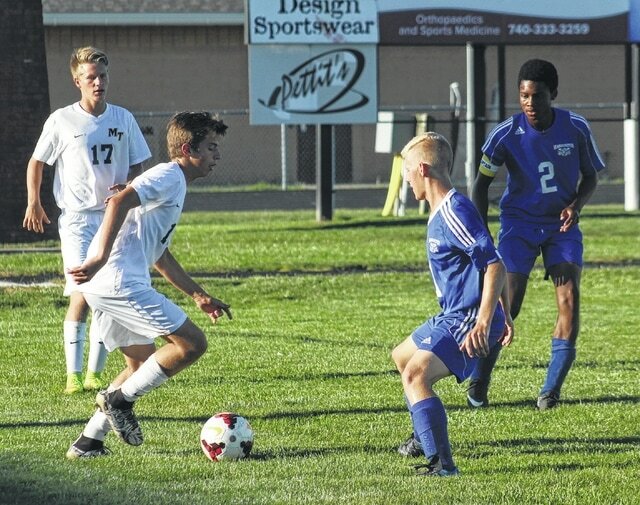 Miami Trace saw Washington score first, but, the Panthers held the Blue Lions scoreless after that, scoring three times in the match for a 3-1 victory. The match was scoreless until Seth Hanusik scored for Washington at the 25:36 mark of the first half. The assist went to Blaise Tayese. Washington held on to the 1-0 lead for over 17 minutes, until Blake Pittser scored the equalizer for Miami Trace with 8:22 to play in the half. There was no assist for that goal. With 4:48 remaining until the half, Ethan Conn scored for the Panthers, the assist going to Pittser. This proved to be the game-winning goal. Miami Trace’s Thomas Bondi scored what would be the final goal of the match at the 18:47 mark of the second half. There was no assist for this goal. Taking a look at the numbers, Miami Trace had 21 shots on goal to 6 for the Blue Lions. In goal, Tim Kinzler had four saves for the Panthers and Brian Wilson had nine saves for Washington. “They controlled the game from the start,” Washington head coach Aaron Teter said of the Panthers. “They came with a lot of energy in their mid-field. But, we stopped them at the goal. While they were dominating play, the score was 0-0. “Then, we snuck through real quick,” Teter said. “We got Blaise out in the open, and, everyone’s afraid to see that. Blaise passed it over to Seth who beat Timmy on a shot on the ground. “That was a good momentum switch for us,” Teter said. “And, I think we controlled the game for a while after that. Then, they got the two goals closer to halftime. “We felt like we played below our standard the last two times out,” Miami Trace head coach Josh Thoroman said. “We got through a game (McClain) with a one goal win (3-2). We probably should have played a little better. Then we had a 0-0 game against Massie. Miami Trace is now 4-2-1 overall, 2-2-1 in the SCOL. The Panthers host undefeated Chillicothe Thursday at 7 p.m. The Cavaliers have not lost a match in the SCOL since they joined the league in 2013. The Blue Lions, now 4-3 overall, 3-3 in the SCOL, are at Clinton-Massie Thursday at 7 p.m.